So I called out the bedroom windows for being too small to meet the egress requirements (at a 2nd story bedroom they were 4.1 SF of openable area by raising the lower sash). The builder replied that it’s a double-hung window, so by removing the top and bottom sash, the required area is met. Never heard of that one nor could I find anything that supports it on the web. The builder replied that it’s a double-hung window, so by removing the top and bottom sash, the required area is met. No special tools or knowledge…you should have to just open the window and escape or whatever, not disassemble it. Ask him how the fire rescue/emergency personnel are going to remove the top and bottom sash from the Exterior. And no using their Axe doesn’t count. That was my 1st thought. The “builder” builds houses as a part time job. This is his 4th house – ever. Lots of other issues as well. Well, he’s creative at least. I was at a loss for words. I said, well, I better research that. The NC code itself is below. As said above, no special knowledge or tools shall be required. It’s not that creative. I’ve used that defense before doing bedroom additions, and it worked with AHJ. The ingress question is not really valid as most windows are locked anyway and would impede a firefighter getting in without breaking something. They do need to be tilt sash double hung windows though. It can also be a casement or sliding window as long as it meets the 24" high by 20" wide requirement. I vote in favor of the contractor, all I need as a firefighter is an opening I can easily break out. The AHJ’s in our area will allow double hungs. Second story DH sashes are often removed to deliver drywall in new construction. Children do not know how to remove a sash. My 26 year old son couldn’t figure it out, sad to say. A fat-azzz couch potato needs to be able to get out the window. That’s my stance. Did you read the code above? It clearly says no special knowledge or tools shall be required. I agree with Joe, removing sashes to bring in drywall is merely construction savvy, not expected of any occupants of a building. When the lower sash is open. Unobstructed area. The top part of a double hung window is obstructed. No tools or expertise required. The bottom of the egress window opening can’t exceed 44” from the finished floor. 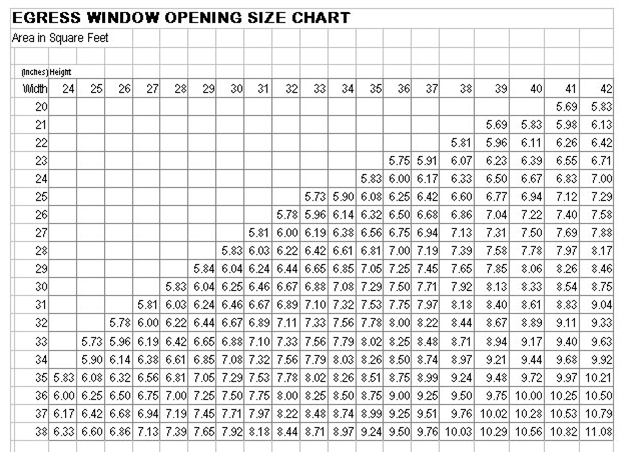 The minimum opening area of the egress window is 5.7 square feet. The minimum egress window opening height is 24” high. The minimum egress window opening is 20” wide. Wisconsin egress windows. For any window used for exiting, the lowest point of clear opening should be no more than 60 inches above the floor. If the lowest point of clear opening is more than 46 inches above the floor, a permanent platform or fixture should be installed such that a flat surface at least 20 inches wide and 9 inches deep is located no more than 46 inches directly below the clear opening. The topmost surface of the platform or fixture should be no more than 24 inches above the floor. [size=2]The window shall be openable from the inside without the use of tools or the removal of a sash. If equipped with a storm or screen, it shall be openable from the inside. The nominal size of the net clear window opening shall be at least 20 inches by 24 inches irrespective of height or width. Nominal [FONT=Arial][size=2]dimensions shall be determined by rounding up fractions of inches if they are ½”[/size][/FONT] inch or greater or rounding down fractions of inches if they are less than ½[FONT=Arial][size=2]”[/size][/FONT] inch. No portion of the window, including stops, stools, meeting rails and operator arms, shall infringe on the required opening. The area and dimension requirements may be infringed on by a storm window. Canadian Code, Marcel. As well, provinces may have varying rules. Post it in the Canadian section and not confuse new inspectors. for those that don’t have a chart blank areas do not comply!